Hey y'all! Sorry about going dark yesterday - the day got the best of me and I totally ran out of time to post. I'm back though (I know you were worried, ha! ), and today I've got a fun post full of ideas for you to customize your IKEA furniture ('cause we all have a little bit of that, right?). There's a reason IKEA furniture is so popular - it's inexpensive, good (enough) quality, functional, and it's easy to find pieces that will fit pretty much anyone's style. Those are all good things, right? But why not take their simple designs a step further and customize them - "hack" them, if you will - to make them a little more you? Custom pieces for a fraction of the normal cost? Yes please! The hacks these bloggers completed are so creative, and I've gotta say, I'm incredibly inspired by the results. Makes me want to break out some paint and tools and take on something like these myself! These eight pieces are my current faves. Some have been on my Pinterest boards forever, and some are recent additions. Let's go through them, shall we? 2 | You know those library card files that are so popular? While we all wish we could have the real thing, this mini version from The Painted Hive makes for a great substitute. 3 | Meg Made Designs turned this Expedit into a cool printer's cabinet. This is the most "involved" DIY of the group, but if you're handy and have the right tools, I'm sure you could take this kind of project on, no problem. 4 | The Sweet Beast's Svalbo sideboard with dipped legs is such a fresh-looking piece. I love the happy color, and the fact that she felt free to remove the bottom (which didn't prove to be as simple as it sounds!) shelf to make it fit her style and needs. 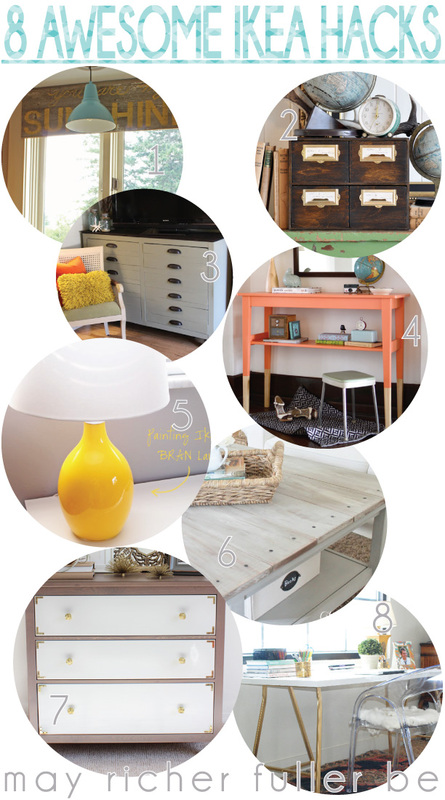 5 | I love happy-colored lamps and Jessie's painted Bran lamp certainly fits that bill! All she did was swirl a little paint on the inside of the base and she was all set. 6 | This barnboard coffee table was a lesson in persistence and patience for Jen at City Farmhouse. The result is a lovely, rustic table that she loves. She also shared a great tutorial on the homemade stain she used to "age" the boards on top. 7 | The campaign-style furniture trend continues to stick around, and this Hemnes dresser by Lacquer and Linen echoes that style - but with a fun twist. Instead of campaign-style drawer pulls, she used some gold knot pulls. You'll have to head over to her post to see those up close. Love 'em. 8 | This desk with trestle-style legs and a lacquer top by White and Gold Designs (via Little Green Notebook) reminds me of our DIY desk, but with an extra dose of shininess. Look at those legs! Feeling inspired to hack your own IKEA pieces yet? One thing you might notice (or maybe I'm just aware if it!) is that I only mentioned one hack of the ever-popular Expedit bookcases...that's because I wrote a whole post on my love for and a couple of awesome uses of that iconic IKEA piece here. Check it out, or follow my Expedit Pinterest board if you're looking for a little more inspiration for those. P.S. I'm putting the finishing touches on a little project I've been thinking about and working on for awhile, and I'm excited to share it this week! Hint: it involves my first-ever adventure in staining, and some hand-painted letters. Any guesses on what it is? I look at the Ikea Hacker website any chance I get. I think people are so creative. I'm a new follower. Thanks Khloe! I love that website too :). Glad to have you as a new follower - hope you enjoy my little blog!